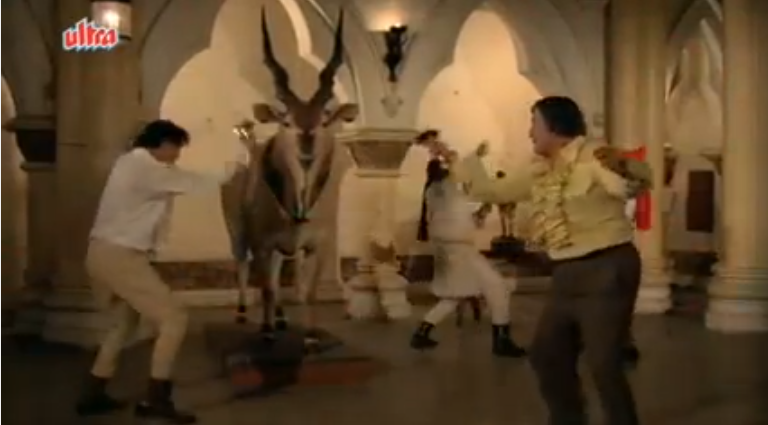 Bandie, a 1978 remake of The Prisoner of Zenda, probably works better as an artifact than as a film. Its components seem excellent or at least intriguingly oddly chosen on paper, but they don't add up to much—and certainly not into much that needed to be made in the first place. For starters, hero Uttam Kumar had already been in a Bengali version of The Prisoner of Zenda, Jhinder Bondi*, way back in 1961. While not a perfect film, it has its pleasures: the music is superb, the location filming in Rajasthan is suitably royal, and the shades of swagger and ego bandied about by Uttam and adversary Soumitra Chatterjee are scrumptious, even if just in a meta, Bengali thespic nutshell sort of way. As in the recently discussed Sikandar, it's also possible that being filmed in black and white has helped Jhinder Bondi age more gracefully, its visuals still relatively dignified. There is nothing dignified in Bandie (which is not a complaint). However, its campiness, which may owe to its era and Hindi masala milieu as much as any deliberate decision on the part of director Alo Sarkar to contrast it with JB, does give it one distinct advantage. Here, the promise implied by the ocean of ruffly and/or puffy shirts and jodhpurs of loads of sword fights is properly realized! Especially after the empty teases of Jhinder Bondi, this is no small gift, and I enjoy all the stabbing and leaping around very much indeed, especially done by Uttam Kumar, who may be a little old for it but is certainly throwing himself into it and providing plenty of delicious cognitive dissonance with the kind of herogiri I've seen him perform in his classic Bengali movies. 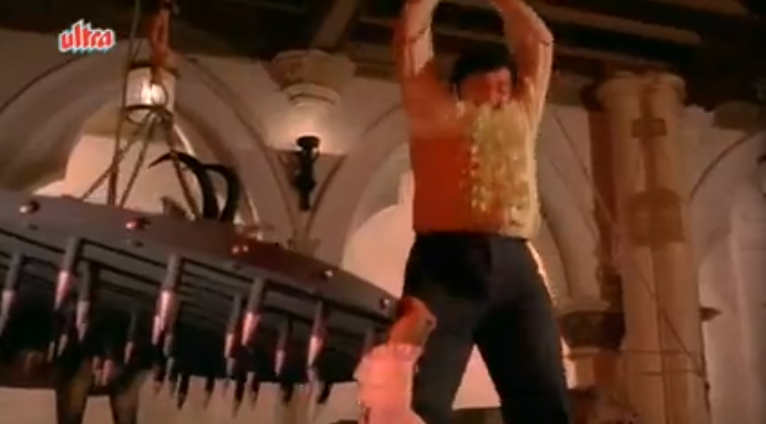 There are also garish splashes of bright masala blood, galloping horses, and medieval-looking torture devices. I would not argue with you if you thought these features alone made Bandie better than Jhinder Bondi. 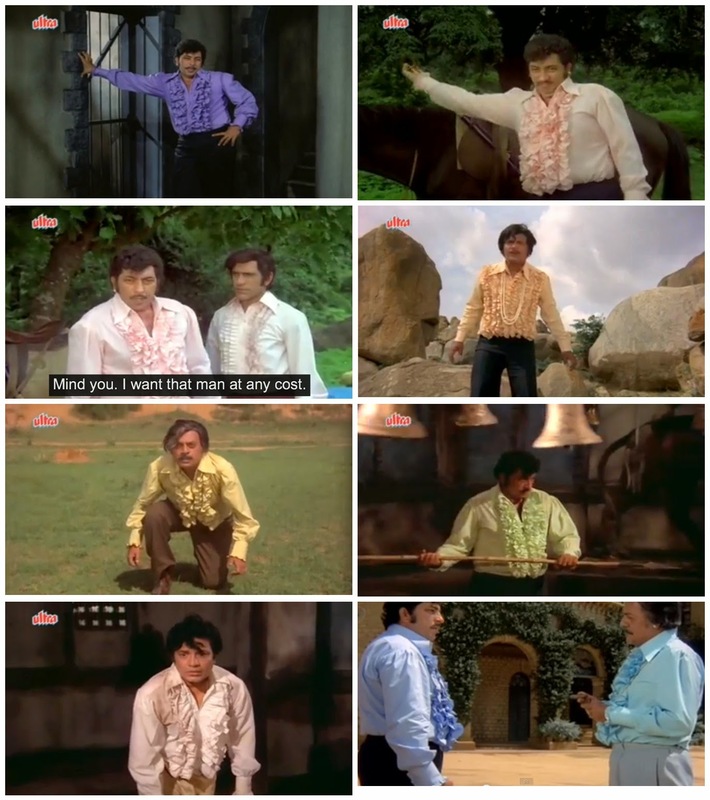 Additionally, the very concept of an Uttam Kumar-Utpal Dutt showdown** is very satisfying. 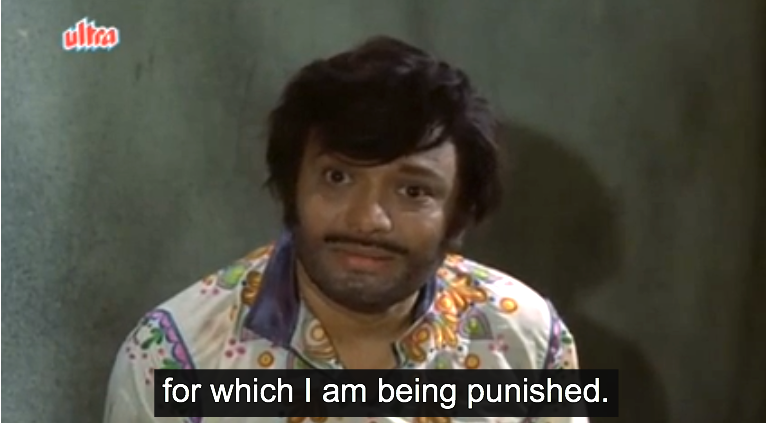 In many ways, Bandie is basically Manmohan Desai with sparser visuals. For example, listen to this flashback prologue. 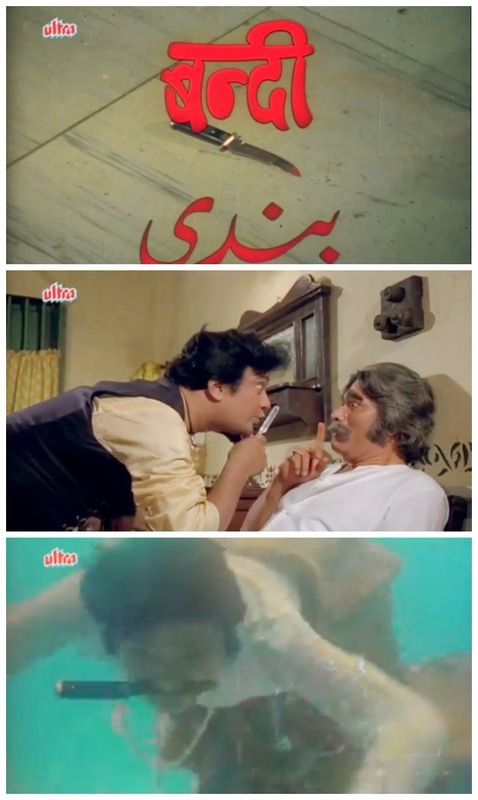 The king of Bharatpur (Satyendra Kapoor)'s evil brother (Utpal Dutt) schemes to put his own son (Amjad Khan, once the story catches up to "now") on the throne by having the elder queen (Indrani Mukherjee) abducted. The hit man hired to do the dirty work, however, gains a conscience when she admits she's pregnant; when he is offed for not doing the job, she flees to a temple and winds up staying there to raise her son. I love this visual of her clinging the temple bells to keep from collapsing. VERY DRAMATIC. After a few years, Utpal finds out she and her son are still alive, and he seeks bloody fulfillment of his earlier plan by stabbing Indrani, the temple priest, and the priest's son, whom he mistakes for Indrani's—all while Indrani's actual son looks on in horror. He grows up to be Uttam Kumar as a lovable scamp/thief. Meanwhile, the king's junior wife's son, also played by Uttam Kumar, has come in line for the throne but is a debauched, drunken mess. He is easily manipulated by the charms of Bindu, who also works for Utpal but is secretly in love with his henchman Amrish Puri. 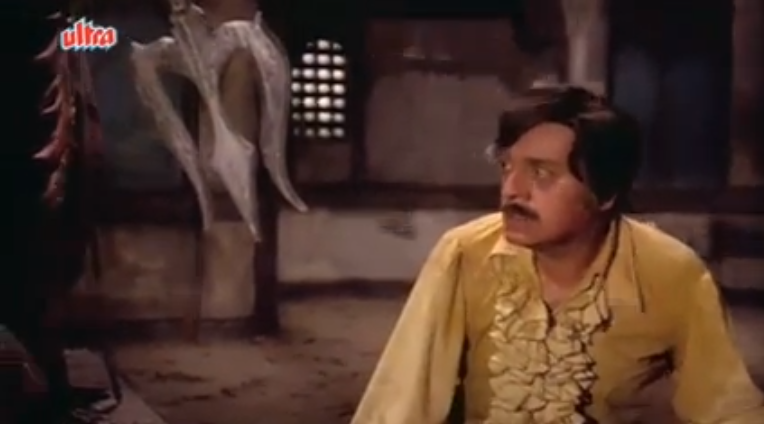 (If you think that having Amrish Puri and Utpal Dutt in the same film means a bugging eyeball will fly out of its socket, you'd be quite correct, though unfortunately they never directly have a stare-off.) Sadly, drunk prince is abducted and locked away by Utpal/Amjad as they attempt to grab the throne; in the meantime, loyal royal employee Iftekhar has stumbled across thief Uttam (without realizing that he's the senior queen's son, of course) and gets him to stand in for the junior prince until after the coronation so that Amjad cannot be crowned. 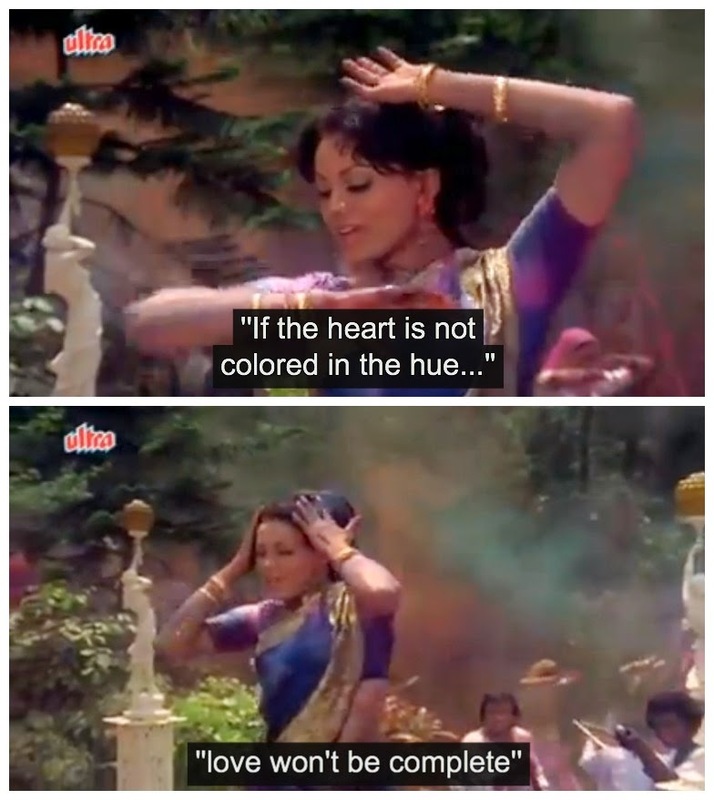 Rounding out the cast is Prema Narayan as Sulakshana's maid; she has no romantic or comic plot of her own but does have a good dance in a Holi song that I'd never seen before. Doesn't this sound like Dharam Veer? 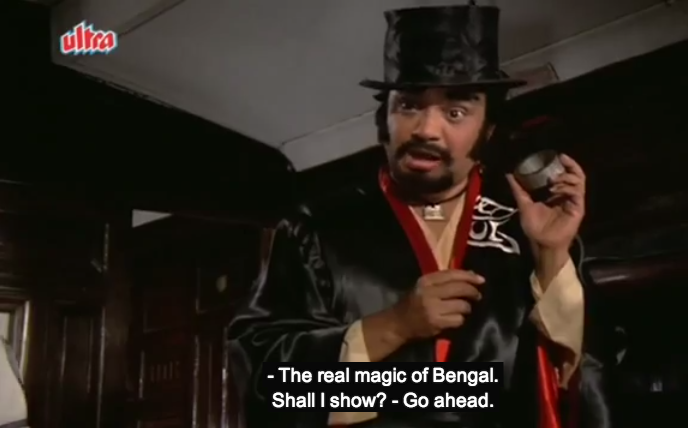 Even if you don't share my excitement in seeing Calcutta's biggest star in a Dharam Veer knockoff, can't you imagine how great it could be? Yeah. Too bad they didn't make that film. Simply out of academic fascination, I feel compelled to examine how Bandie meets R(ecommended) M(asala) A(llowance) without managing to cook up into a great dish. Its list of ingredients is respectable. 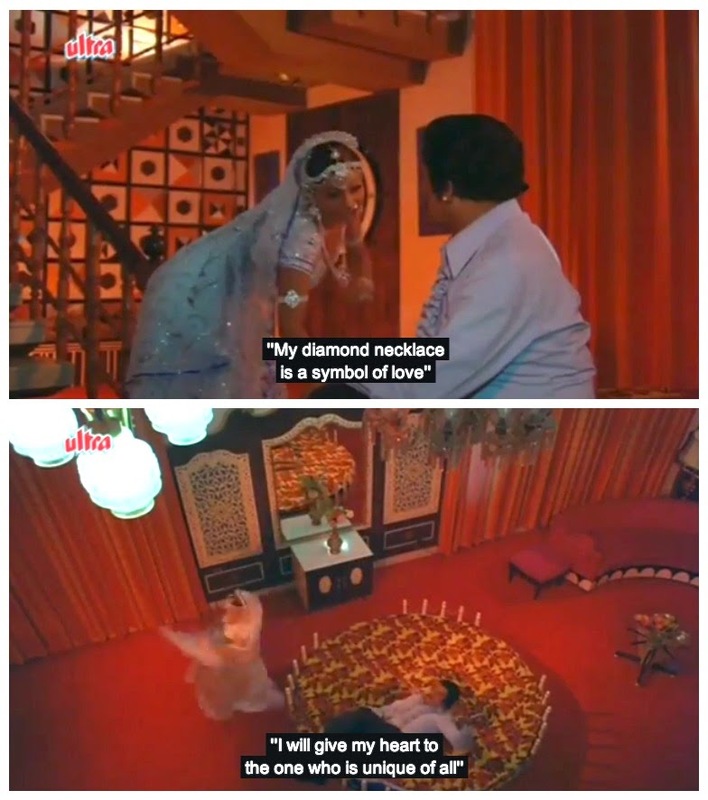 For example, the knife Utpal uses to slaughter his competitors for the throne becomes one of two totem artifacts; the knife helps Uttam in avenging his mother's death, and Indrani's very sparkly, very plastic-y royal necklace serves as the all-important indication of actual family connections. One of the big action sequences sprawls across the what I think are the very rocks used in Sholay. I'm not an expert on Uttam Kumar, but I certainly did not anticipate that the first time I saw him punching bad guys and leaping through the air would be in a bad wig and pearl necklace at age fifty-two in a setting that is forever linked to very different types of heroes. 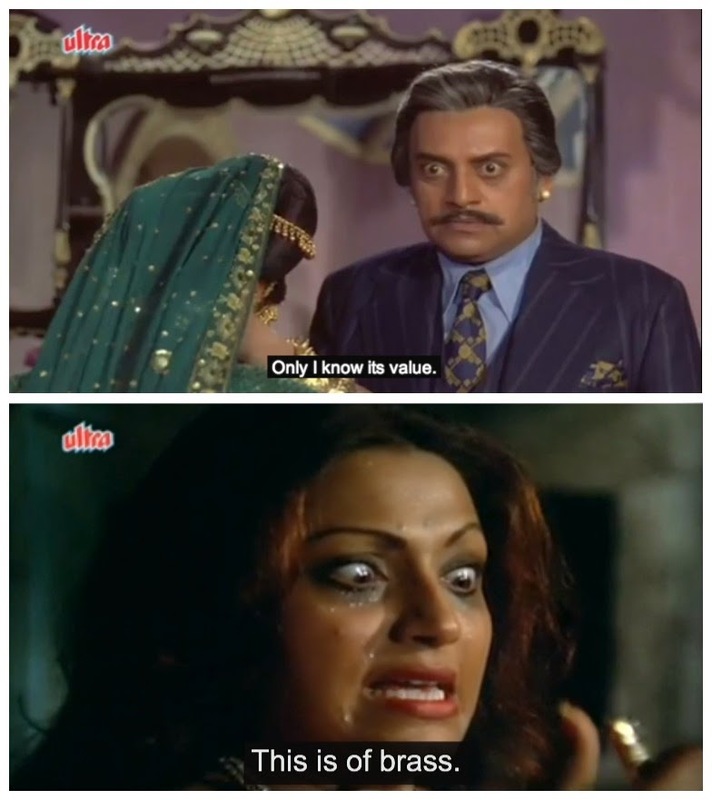 But such is the joy of masala cinema. 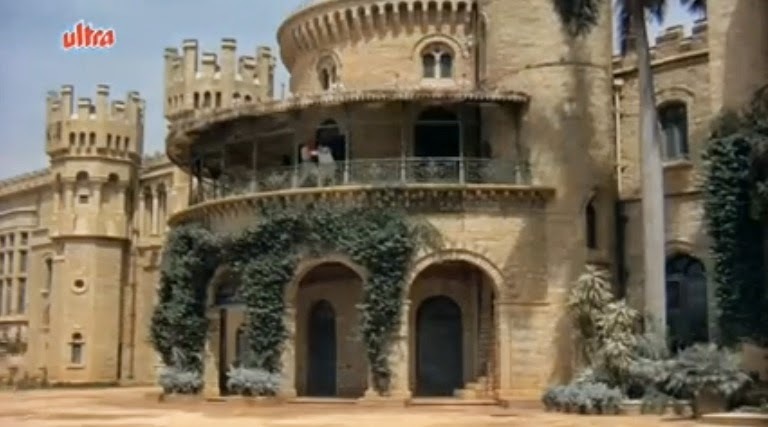 There are at least three other filming locations familiar from other 70s Hindi films. 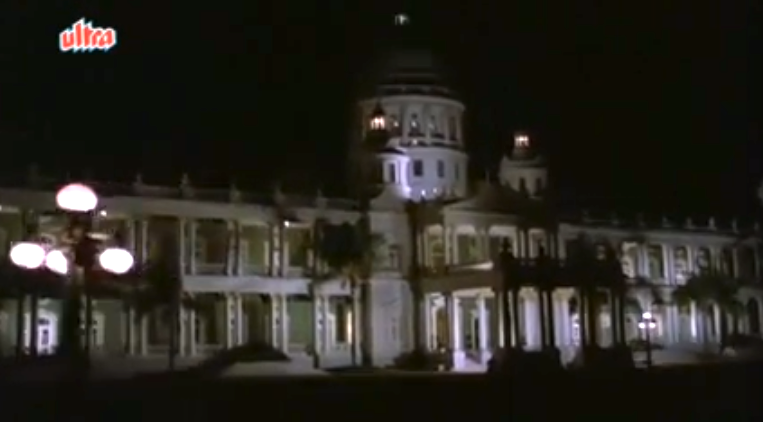 From Desai's own works, we get the British HQ in Mard(and the palace in Rajput, etc.). as does my favorite of the blindingly wallpapered 70s houses (previously seen in films like Shankar Dada, Kaala Pani, and Hera Pheri). Part of why this film never really takes off, I think, is the acting. Putting aside Uttam—who is not, in my opinion, the person you want in roles like this, because his superpowers lie elsewhere, in smoothness and confidence with a slight touch of either class or moral superiority—and even Utpal—who is perfectly capable of Hindi-film oppositionality but here is not given as much scope to indulge—this cast suggests there'd be more crazy in here than there actually is. Bindu is probably the primary masala instigator; she has a significant role with some layers to it a bit beyond "vamp with a heart of gold," and she has a grand time doing it. Decidedly ignoring the concept of subtlety is a key approach in Bindu's toolkit, and she delivers. but they also have an air of phoning it in, and vets like Iftekhar and Madan Puri (as another helpful royal advisor) have nothing to do. There's no sustained glee. Story-wise, there's not much going on either. Since so many films do expected things in exciting ways, it's not fair to let Bandie off the hook for failing to produce anything very interesting just because its plot is so familiar. The tone is off somehow, though—there's no real suspense, danger, or intrigue. It needs more spirit...or at least more wackadoodle. There are moments with promise, mostly thanks to good choices of where to put the camera. Starting at the top of the next image, we have the point of view of Indrani's son watching her collapse onto her murderer; impostor Uttam finally standing in a position of power over that very murderer, framing him as the tiny worm he is, along with a shoe that is a clue to his identity looming over him; and a dramatic view of the final showdown at the same temple where the initial murders occurred in the prologue. 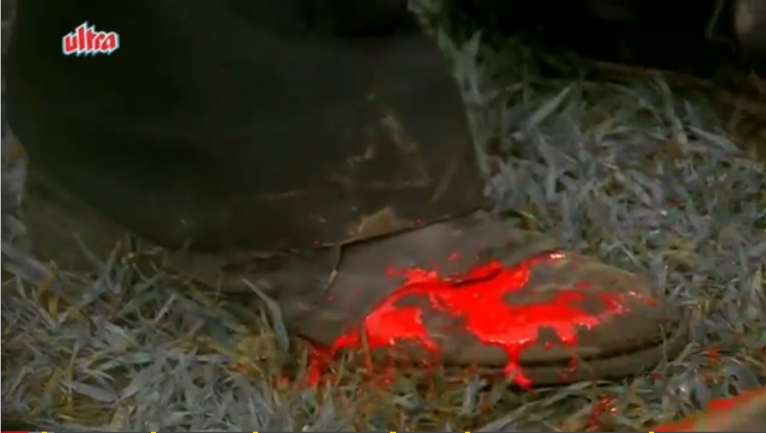 But for every cool shot like those, there's some other artistic choice that leads to mediocrity. My favorite example of this is the scene below (also from the final brawl), in which the on-the-run villain collapses under the trident of the goddess in the temple that witnessed his first crimes. Any masala movie-maker knows that such blocking foreshadows that trident impaling him, whether because the hero rips it out of the statue's hand or a lightning bolt knocks it loose or whatever. But in Bandie it just stays put and the villain is done in in a less divine and frankly much less awesome manner. Bandie is a case of unfulfilled potential, and I'm so curious why it turned out as it did. I wonder if it was also released in a Bengali dub: trying to cater to both Hindi and Bengali audiences might explain why the film isn't full-tilt masala in tone, length, or content, since mainstream Bengali movies tend to be shorter and tauter, but also doesn't seem quite like what Calcutta was making at the time either (though I must admit I don't know first-hand because I haven't seen any Bengali movies from the late 70s that aren't by Ray). Director Alo Sarkar's imdb entry indicates that all of his previous work (of which there is little) involved Uttam Kumar, including directing Chhoti Si Mulaqat a decade earlier, and I would have thought he'd know better than to put the Mahanayak in a role like this. He has no masala experience at all, and maybe he just bit off more than he could chew. The producer, F. C. Mehra, is more seasoned, making gloriously fun films like Jaal and Elaan. A highlight reel from Bandie would make a fun half hour of entertainment, particularly its plentiful fights and some moments in which the leads are enjoying themselves, but it just can't sustain 140 minutes. It's meh-sala. * I fully admit to having an inexplicable obsession with Jhinder Bondi. Mock as you will. 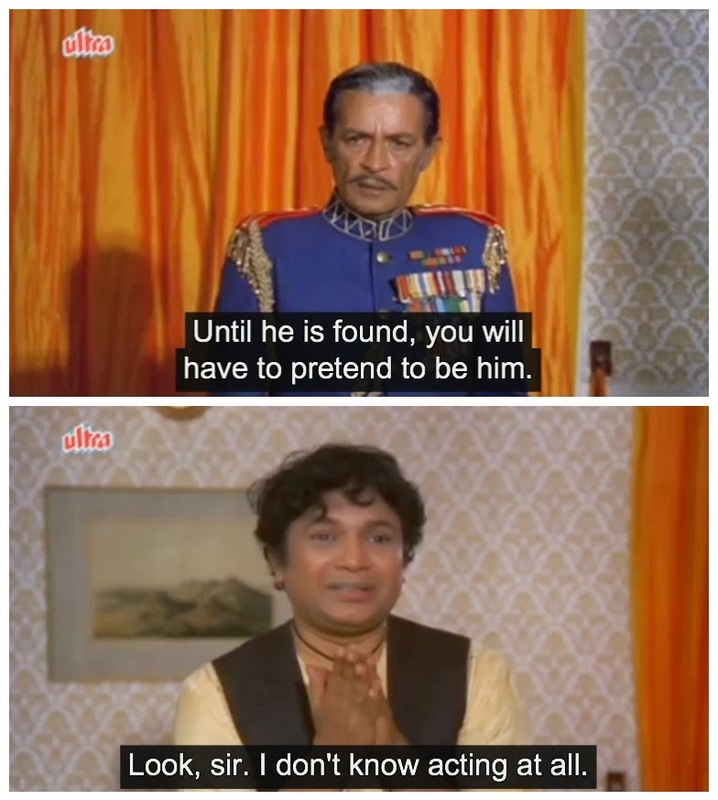 ** Did you realize Utpal Dutt is actually younger than Uttam Kumar? Neither did I until just now.